PayPal’s post-partum future will eclipse eBay’s. The common perception is that eBay is an online auctions business with an attached payments operation, which will be spun off later this year. The opposite is true. PayPal’s standalone business is far more promising – and bigger, too. It may be worth four times as much as the legacy business once they’re separated. PayPal flourished under eBay, which paid $1.5 billion for the startup shortly after the dot-com crash. Plugging the payments service into its auctions network and promoting its use supercharged PayPal’s growth. The result has been a windfall. The division produced $1.7 billion of free cash flow last year, and management thinks this figure should rise about 15 percent or so annually over the next few years. Meanwhile, eBay’s core division is struggling. A cyberattack last year forced users to reset passwords, and a change in Google’s search algorithm made many for-sale items less visible. Competition is intensifying. In the first quarter, revenue fell by 4 percent compared to the same period last year. While the date and financial terms of the split aren’t nailed down, the company has suggested shareholders will receive one share of PayPal for each share of eBay in the second half of 2015. Analysts think PayPal should earn about $2.4 billion of EBITDA this year. MasterCard and Visa are both valued at 16 times profit. PayPal’s revenue is growing about a third faster, bolstered by rapid growth at its Venmo payment app, and Braintree credit-card processing unit. Put PayPal on a 33 percent premium to its rivals and it is valued at just over $50 billion. EBay’s shrinking marketplace unit, which will retain the eBay brand name, is worth far less. It may earn about $3.5 billion in EBITDA. At the high end, investors might value it at four times those earnings, estimates Jefferies, or around $14 billion. Shareholders shouldn’t expect a big return on the split, given the recent share runup. EBay has $7.6 billion in cash, and its enterprise unit may fetch $1 billion or so if sold. Add it up, and eBay is worth perhaps $73 billion, near its current market capitalization. But PayPal will have more freedom to work with other e-commerce giants, like Amazon or Alibaba. The separation won’t only highlight PayPal’s value, it will set it free. EBay said on June 8 that it expects revenue from its marketplace division to be flat or grow as much as 5 percent next year, excluding foreign exchange effects, while PayPal is forecast to grow revenue about 15 percent next year. 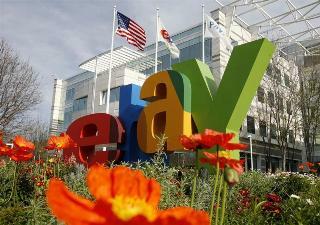 EBay has said it plans to spin off PayPal in a tax-free separation in the second half of the year. The company expects to issue one share in PayPal for each share of eBay. Devin Wenig, president of eBay Marketplaces, will become chief executive of eBay following the separation. Dan Schulman, a former American Express executive, will become president and chief executive designee for PayPal after the transaction.